The New York band fuse the indigenous art of storytelling with musical styles from Latin America and the Caribbean. Combo Chimbita is an eclectic quartet comprised of first-generation New Yorkers from Colombia. 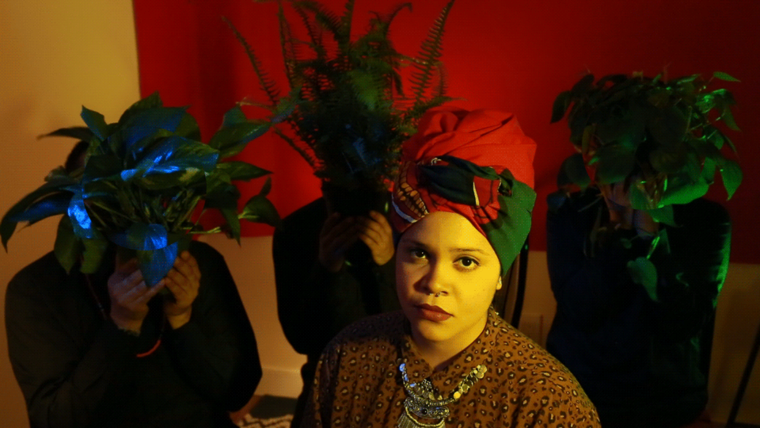 Their debut album Abya Yala, which is premiering today on The FADER, draws inspiration from Afro-Latinx and Caribbean musical styles including cumbia, salsa, and reggae. It opens with a cumbia track called "Dame Tu Mano," which translates as "give me your hand." Over a looped bass line and clanking cowbell, frontwoman Carolina Oliveros soulfully belts a tale about searching for an inner light in her life — leading her band to embark on a spiritual journey throughout the album. Some other noteworthy tracks include the mournful yet danceable "No Regreso" and the hectic, percussion-led "Congo." "We recorded the album live in the room without headphones, with Carolina's vocals and guacharaca over the PA and Prince of Queens looping his bass, and then overdubbing background vocals," Combo Chimbita told The FADER in an email. "On the second night out of the three-day session, [we] went into an hour-long musical trance to create the sonic story of Abya Yala, told through the album's interludes." Catch Combo Chimbita at Baby's All Right in Brooklyn tonight. Tickets here.